Traveling with a newborn is exactly what it sounds like – but don’t be fooled by that. My husband and I figured that there was a big difference between listening to Lyovka cry from colic in a Moscow apartment, and listening to Lyovka cry from colic with a view of the Black Sea and the Kara-Dag volcano. We were right to pick the latter option this August. Traveling relaxed him. At worst, we took turns eating at restaurants while Lyovka was being wheeled around in a pram thoughtfully provided by a random person when we first got there. 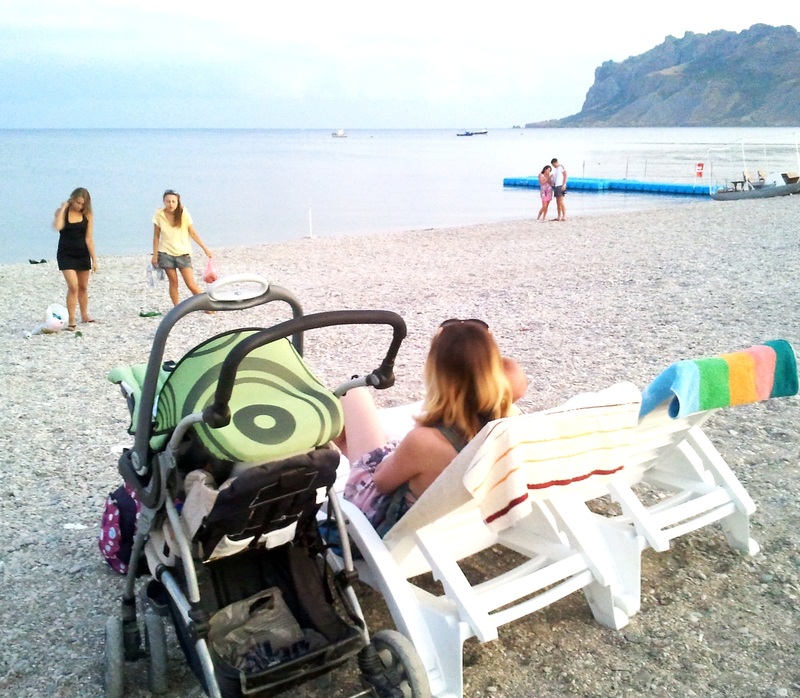 In general, Koktebel was awash with thoughtful random people at the end of summer. The plankton in the water lit up at night. Musicians played Pink Floyd covers, bathing suits were optional, people lit up lanterns and sent them out into the air and the open sea. Now I’m in Kiev with a fever. Typical, typical. Babies apparently attract thoughtful random people. You ought to be able to rent them when you think you might be going to need some extra help. I have really wonderful memories of Crimea. I love seeing your photos, and I’m glad that Lyovka is learning the Black Sea early. I had to work for that one. For a while I thought it was a type of chameleon found only in South Africa, but that didn’t make any sense. Crimea remains highly recommended. Despite the bad clubs still springing up everywhere. And yep – Cape Chameleon is opposite Kara-Dag. All of the nearby formations are amazing, I wish I had time to read more about them now. I used to be quite the expert as a kid, but all of that knowledge is jumbled in my head. It easier then travelling with a toddler. Top travel tip is for the aforementioned baby/ toddler to travel with their dad, because then everyone treats the dad like he is some kind of hero and cannot be helpful enough. This contrasts strongly with what happens when Mum and baby travel together. Hope you had a lovely time and get well soon.